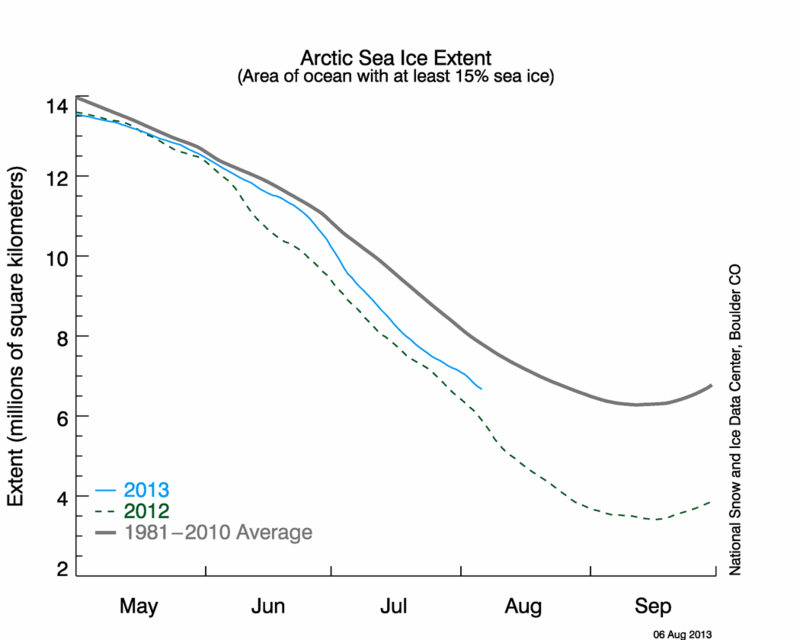 The summer sea ice in the Arctic continues to melt at an alarming pace. It now stands at the second lowest point since records began (just above the exceptional melt of 2007). What is more, the rate of melt at this point of the decline season is greater than for any other year since the satellite monitoring record began, and because of the relatively cold northern winter of 2007-2008, the total area of ice that has been lost to melt this year also looks set to break new ground (or is that new ocean?). For the second year running, the Northwest Passage is open to shipping. The National Snow and Ice Data Center in Colorado, US, has just posted an update of the current situation, which you can read here. There are also graphs and maps at this site which give you a fuller picture of the situation and which complement other useful visuals available at Cryosphere Today. But a particularly interesting comparison has been prepared, and is regularly updated, by Phillip Sutton of GreenLEAP (who is also co-author of the new book Climate Code Red). That is the graphic given at the top of this post. This visual aid is unique in that it compares 2005, 2006, 2007 and 2008 vs the 1979-2000 median (the standard graphic only compares 2007 and 2008 to the median). 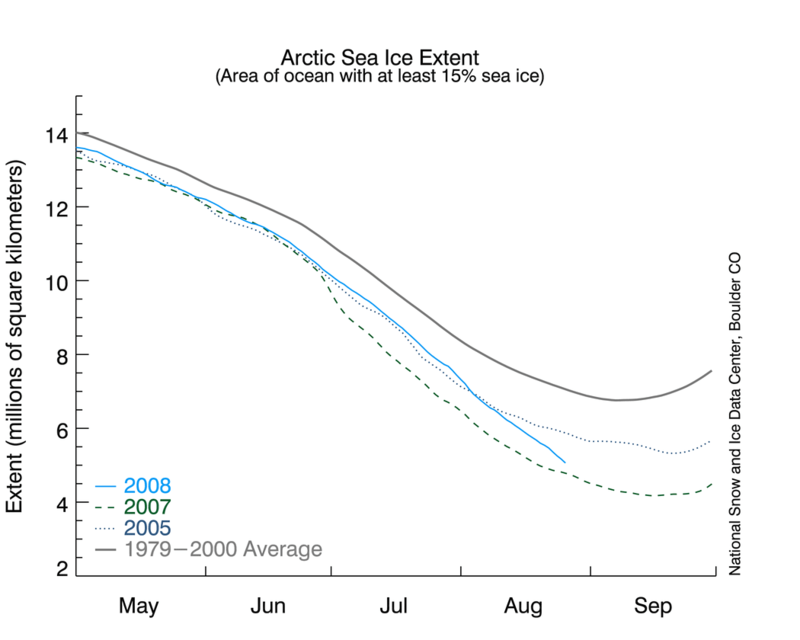 To my mind’s eye, this gives a fuller – starker – picture of just how precipitous the decline in Arctic summer sea ice now is. 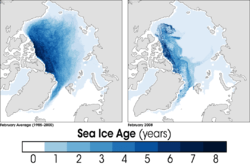 The reason for the unusual pattern of fast late melt this year is complex, but the underlying cause is clear enough – look at the inset picture of the age of the sea ice. It shows the Arctic sea ice age in February 2008 compared to the average for 1985-2000 (NASA). Dark blue is old, thick ice, light blue is young, thin ice, vulnerable to melting. In the 1980s more than 20 percent of the sea ice was older than six years – that figure has fallen to a mere 6 percent, with a massive concomitant loss of total ice volume. Gareth Renowden of Hot Topic also makes a disturbing point regarding Arctic methane, and Joe Romm of Climate Progress shows how the denialosphere can spin any situation to suit their preconceived position. Also, I wonder why Andrew Bolt has now gone quiet over this particular issue, given the way he was triumphantly proclaiming this as a non-event just a few months ago? Or, is this modern warming period confined to the Northern Hemisphere? Well, GCMs predict that warming in the antarctic will be much slower than in the arctic. I suppose in your mind that the success of this prediction is evidence that the GCMs are wrong? Do you understand why the arctic and antarctic might be expected to react differently? Have you ever looked at a map? Thoughtfully? We also know the difference between a statistically insignificant factoid and a statistically significant trend. Do you? 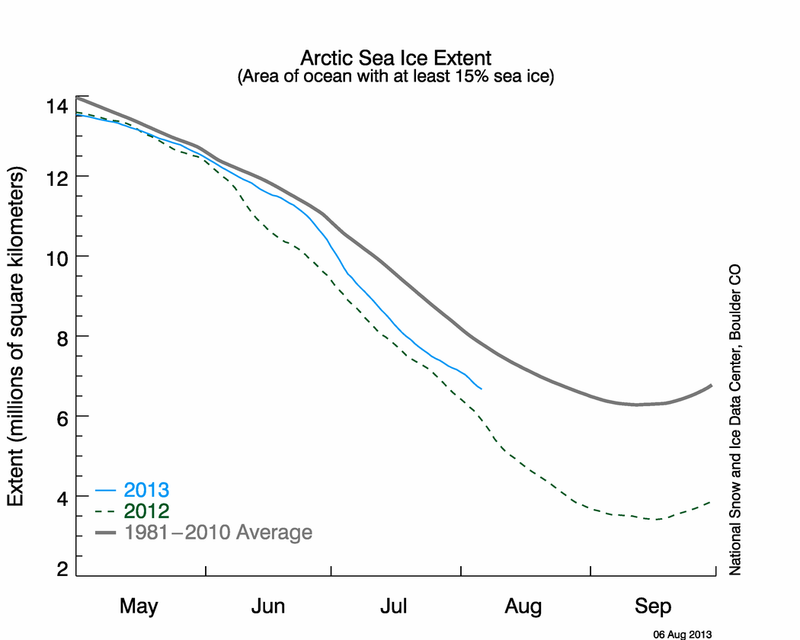 Well Greg we’ll have to see how the final result pans out – at the moment http://nsidc.org/data/seaice_index/images/daily_images/S_timeseries.png is below average. I’ll do a post on Southern Hemisphere sea ice and ice shelves soon. It is an important topic, and in contrast to what Greg rather naively hopes, the stable southern sea ice yet loss of ancient ice shelves is consistent with predictions of ocean heat content and its effect on precipitation, and bottom up vs top down forces. But as I said, it needs a full post to explain. I too wish Antarctica would be able to survive global warming. East Antarctica: Marked seasonal fluctuations but no mean ice loss during 2002-2005. 3. The above is consistent with observed ice shelf break-up, which reached a peak in 9 July 2008 when, for the rist time during winter, ice was observed to continued to break. I will send the relevant paper and images to Barry Brook in case he wishes to display them on this site. Was just talking about this to colleagues this morning. The current rate of melt is extraordinary… and to think that we are witnessing this at solar minimum and in the year after a La Nina is unbelievable. BTW some nice southern Sea Ice plots can been seen on the Antarctic CRC website at http://staff.acecrc.org.au/~preid/seaice/ . 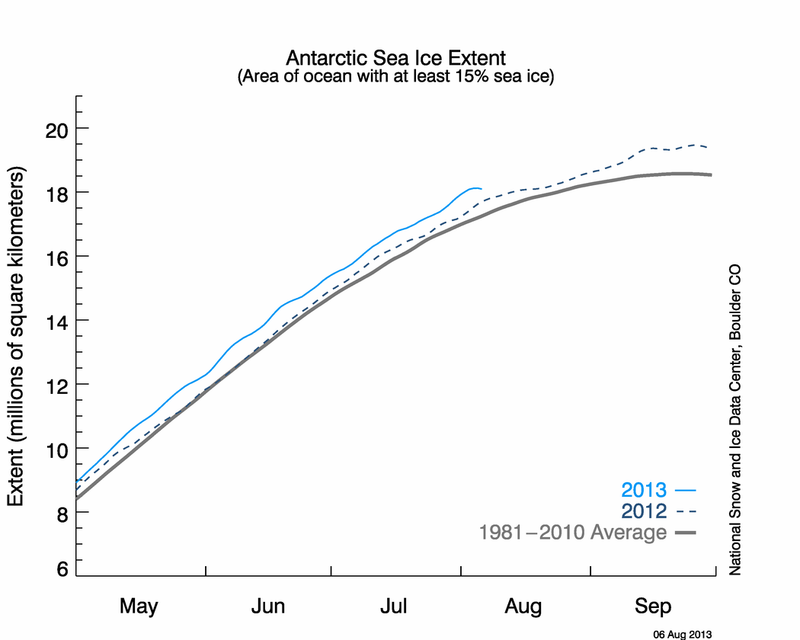 The current extent is near to a record low for this time of year – http://staff.acecrc.org.au/~preid/seaice/gsfc_sh_extent.html – though the small variance and strong seasonal cycle make drawing conclusions problematic. The current rate of melt is extraordinary… and to think that we are witnessing this at solar minimum and in the year after a La Nina is unbelievable. Indeed, scary stuff. And if that rate persists for just another 3 weeks or so, it looks like we will exceed the 2007 record melt. Which is obviously conclusive evidence for the famed ‘global cooling’, and the impending catastrophic ice age. Has anyone suggested that this decade’s Arctic shrinkage is the reason why atmospheric temperatures have been flat? I did a quick calculation the other day using the numbers from Hansen et al 2005 on global energy imbalance and found that the net annual influx of energy should be more than enough to melt 100,000 km^2 of Arctic sea ice per year. In fact it seemed to be at least one order of magnitude greater, possibly more. I want to revisit my calculations when I get the time, and I recommend the exercise to every numerate person: look up the latent heat of ice, the latent heat of liquid water, the “heat of fusion” of ice, the depth of the Arctic ocean and the thickness of the Arctic sea ice, and make some naive calculations about the energy required to heat up the Arctic by x degrees or to melt the sea ice completely. That should read: specific heat of ice, specific heat of liquid water, latent heat of ice. Mitchell, I think you are partially right – the full story seems to involve oceanic, land ice and sea ice energy sinks. I’m going to blog on this topic shortly also, as it is key to understanding what is happening to air temperatures – and how to interpret them. Mitchell and Barry at 10 and 11 – I raised this with some sceptics a few months ago, and was roundly criticised for thinking this. I’m pleased to see that I wasn’t completely chasing my tail, and I am looking forward to your topic on this, Barry. posted 27 August 2008 at 5:53 PM by Bernard J.
I suspect Mitchell is correct. Global cooling due to Arctic Sea ice melt may be in principle analogous to the Youngest dryas cooling, at 12 900 years-ago (Steffensen et al., Science Express, 19 June 2008). At that stage temepratures in the northern hemisphere plumeted abruptly by several degrees in connection with melting of the Laurentian and Fennoscandian ice sheets, cooling of the North Atlantic and collapse of the Gulf Stream. There was much more ice at that stage than there is now though the principle is similar. “Influence of the Gulf Stream on the troposphere” by Minobe et al. I am not a climate scientist but am glad to find an informed discussion of this topic. Following this trend via the NSIDC website I find it amazing there hasn’t been more media coverage of what seems a major shift. I have a question in light of this – does anyone know what progress is being made on models of large ice sheet melting? The obvious (to me) implication is that Greenland will also start melting faster. I presume that as it becomes less surrounded by Arctic ice it is more exposed to warmer air and water and hence will melt more quickly? Or is that not how it works? One of the things I have found most frustrating in the (scientific) global warming debate is the uncertainty about forecasts of sea level rise. Intuitively the IPCC4 forecasts seemed very low. Interesting musings, Mitchell, but there’s another parameter I’d like to throw into a back-of-envelope calculation – the thermal conductivity and other insulating properties of ice w.r.t. open water. Everyone goes on about the positive feedback effects of the albedo drop from ice to water, but what about the half of the year when there’s little or no sun? Presumably the ocean will give up more of its stored heat more readily during the polar night without an initial ice cap than with one. Surely this constitutes a significant negative feedback process? …and more to your original point, Mitchell, I’d predict (skating onto thin ice (sorry ;-)), not having checked the data) that air temperatures in the vicinity of the Arctic should be higher in response to reduced ice cover, at least during the northern winter, by the process I’ve outlined. For overall atmospheric cooling to be measured thus implies masking by considerably lower temperatures elsewhere. NASA satellite gravity and microwave measurements indicate a doubling of Greenland ice melt areas per decade (NASA 2006). Rates of ice loss of the Greenland ice sheet have increased from 0.05+0.12 mm/year during 1961 – 2003 to 0.21+0.07 mm/year during 1993 – 2004. The measurements indicate an increase in ice-sheet melt area by 16% from 1979 to 2002 (Steffen & Huff 2002; Steffen et al. 2004; NASA 2006; Hanna et al. 2005; Thomas et al. 2006; IPCC 2007; Hansen et al. 2007a). STEFFEN K. & HUFF R. 2002. A record maximum melt extent on the Greenland ice sheet in 2002. Cooperative Institute for Research in Environmental Sciences (CIRES), University of Colorado at Boulder. STEFFEN K., NGHIEM S. V., HUFF R. & NEUMANN G. 2004. The melt anomaly of 2002 on the Greenland Ice Sheet from active and passive microwave satellite observations. Geophysical Research Letters 31, L20402, doi:10.1029/2004GL020444. THOMAS R. E., FREDERICK W., KRABILL S. & MARTIN C. 2006. Progressive increase in ice loss from Greenland. Geophysical Research Letters 33, L10503, doi:10.1029/2006GL026075. to keep their northern routes open for a while into the freezing season this fall? The benefit to their shipping costs would be awesome. The soot fallout in the Arctic from diesel ship engines would also. During the mid-Holocene (7,000 years ago) the sea was open during summer several hundred kilometres north of Ellesmere Island and the north coast of Greenland. This indicates that the seasonal sea ice cover was significantly less than present and possibly completely ice free on occasion. There is a large range of independent evidence of this and it is not a controversial or disputed issue in the earth and life sciences. – Predict that the albedo effect of losing the Arctic ice cover in summer will push the global climate over a “tipping point” that leads to a catastrophic climate change need to explain why this did not happen 7,000 years ago. – Frighten children with predictions of massive, world-ending outbursts of methane hydrates from the floor of the Arctic Ocean need to explain why that did not happen 7,000 years ago. – Predict the extinction of the polar bear need to explain why an animal shown to have evolved to its modern form 12,000 to 20,000 years ago, still exists when its summer hunting grounds were completely disrupted 7,000 years ago. What exactly is this ‘catastrophe’ that is supposedly happening? Greg, no one is disputing natural variability in climate change. Indeed, glaciations and interglacials have happened in the past and will happen in the future and, like you say, this is not disputed. However, humanity has never before conducted an ‘experiment’ as we have been. Considering there is robust and rigorous evidence suggesting humanity is largely responsible for this ‘current’ change in climate, it would be prudent to tread with caution. We only have one ‘test-tube’ to conduct our experiment in, the ‘alarmists’ on BOTH sides of the fence should pull their head in. What is required (as always) is dedicated and rational scientific discipline. Unfortunately, there are those that ‘contaminate’ the science by their political ideology, their economic rationalism or their ignorance, the antithesis of good science. Where do you stand? Do you think Barry Brook or those like him have a hidden agenda? Greg, nowhere on the web page to which you link is there a claim that the Arctic was ice free 7 ka, or indeed that it even had ‘significantly less ice cover’. So I’m curious – to what part of the NOAA Geophysical fluid dynamics laboratory website were you referring? Or alternatively, which scientific paper which stated this and/or reviews the large body of evidence you claim makes this an uncontroversial and undisputed issue? But even without this evidence to back up your claim, the broad answer is clear enough. The forcing effect in the mid-Holocene optimum was a slight difference in the orbital parameters, and was concentrated in the northern low latitudes — hence the more pronounced regional impacts. Now, the forcing via fossil carbon are global, and on that scale are considerably more important in influencing the planetary climate system. A tipping point is only tipped is the system is primed for it. 1. Oxygen isotopes of ice cores and marine plankton indicate temperatures about 7500-8000 years ago were lower than at present by about 0.3 – 0.4 degrees C.
2. At that time a gradual to intermittent decline commenced toward the next glacial cycle. 3. Following rise of CO2 and CH4 at 11 270 years-ago greenhouse gas levels stabilized at a maximum of 300 ppm CO2. By contrast they are now rising at rates of 2.4 ppm/year (2007) and have reached levels of 387 ppm — some 40% higher than peak interglacial levels over the last 640 000 years. 3. An increase of 1 ppm CO2 in the atmosphere equates approximately in +0.01 degree C temperature rise. 4. The ice sheets formed in the late Eocene (about 34 million years ago) when CO2 levels declined below 450 ppm. Currently CO2-equivalent levels (a value including CH4 forcing) is 433 ppm. 5. Consistent with the rise in GHG/radiative forcing levels, the ice sheets are melting at exponential rates, including west Antarctica, where for the first time the Ross ice shelf has been observed to break up during the southern winter. 6. Sea level has been rising from rates of 0.5 mm/year early in the 20th century to 3.5 mm/year in 2007. Total melting of Greenland and west Antarctica ice melting track toward 14 metre sea level rise. The above is documented by direct ground and satellite observations reported by major science organizations and hundreds of publications. Do climate scientists have an agenda? Of course we do — namely the professional duty of scientists to report observations arising from their research which may give rise to concern for societies, very much as medical doctors do. In othe words, an agenda identical in principle to than those of scientists who pointed out to the ozone depletion, or to the consequences of tobacco smoking, or to the aids virus, and were heavily criticized — including ad-hominem – by vested interests. I’m also very interested to learn where Greg gets his info on the Holocene Climatic Optimum, because it doesn’t square with anything I’ve read. Andrew: can you give me more info on the Ross ice shelf? Are you sure you don’t mean the Wilkins? With respect to you last line, I have been wrestling with several recalcitrants on another blog who still think that there is no proof of the HIV/AIDS connection, or indeed that the virus itself exists. In this case it seems to be a perverse psychology that drives the belief, to the extent that the holders of this notion are resistant to any and all attempts to genuinely, and without malice (growing crakiness on my part is a different thing), enlighten them. I am beginning to think that anyone without appropriate qualifcations, who asks an expert if said expert has an agenda, has an agenda of their own, whether rooted in vested interest or in psychopathology. posted 30 August 2008 at 11:53 PM by Bernard J.
I also downloaded an image from the 9-7-08 for the Ross ice shelf. I have the image but can not locate the URL at the moment. Thanks very much for the excellent sources. If I may say to you all, despite the intrusion of people like Greg 21 (and they rarely identify themselves), please keep up this blog. Nothing will change the denialists opinions but it is very useful for the rest of us to have links to reliable data. I should add that I am a civil engineer and one of the issues that I worry about (apart from solving this problem!) is that I am asked for advice now on what allowance we should make for sea level rise in the design of major new infrastrucure, which often will have an economic life of 30 to 50 years or more. There is little guidance. If we apply normal principles of engineering risk management, for an event causing severe harm we should already be designing for it even if it is merely possible (but unlikely). Yet we are not designing adequately for the current most likley projection let alone any worst case scenario. My point and inference to Greg (he has not replied to the direct questions)was that some scientists (eg Bob Carter) have a hidden agenda. Prof Carter goes on the denialist media roadshow and is lauded by the likes of Andrew Bolt and Jenifer Marohasy – but he does not publish his outlandish claims in recognised science journals – one has to ask why not? Hence my assertion that some scientists him have a hidden agenda. Barry on the other hand is up front about all these issues – with no hidden agenda. In fact, I would say he has all the qualities that any good scientist practises and which you have alluded to – to do otherwise is anathema to their very being. Carter has published a long paper in the journal “World Economics” (December, 2006; vol. 7 No. 4) titled: The Stern Report: A dual Critique”. I replied in an article in the same Journal (January 2007, Vol 8, No. 1). Carter did not respond to my reply. I can send you pdf s of the paper and reply if of interest. And here is the really scary fact about the Arctic ice melt. Even though the area of ice coverage for this year’s melt is currently still above than the 2007 record minimum, the net amount of ice melt so far this year is greater than for all of the 2007 melt season. So, the this year’s net melt is already greater than for the 2007 total, and we still have 2-3 weeks to go before it ends, and it has occurred in a La Nina year. Not looking good for the sceptic camp. Check out the latest NSIDC image update – we are now perilously close to breaching the 2007 mark. If the exceptional melt of 2007 hadn’t happened, we would currently be absolutely floored by the 2008 ice loss. As it is, we still may be… We’ve certainly melted more ice this year than any year on record. Weird things are happening “up north”.